The calcium-sensitive sarcomeric complex is the key mechanochemical transducing unit in muscle cells. It contains myosin, actin, tromomyosin, and three different troponins, one of which, troponin C, binds calcium and facilitates myosin binding to F-actin. The functional sarcomere is controlled by calcium levels which vary due to calcium influx caused by electrical signals acting on the sarcoplasmic reticulum RyR2 receptor channels1. Another level of control is applied by kinases such as myosin light-chain kinase [MLCK], myosin light chain 2 [MLC2], and cAMP-dependent protein kinase [PKA]2,3 which phosphorylate components of the sarcomere. Recently, other forms of regulation have been added to this repertoire such as acetylation, methylation, oxidation, and ubiquitination4,5. The importance of acetylation has recently been elevated by the utilization of histone deacetylase (HDAC) inhibitors in pre-clinical research and the treatment of hypertrophic heart disease6,7, as well as the discovery of several critical acetylated forms of myosin amino acids that need to be modified in order for the sarcomere to function correctly8,9. While studying HDAC inhibitors in cardiac function, Dr. Mahesh Gupta’s laboratory showed that acetylation is important for sarcomere function. The researchers reported that both a histone acetyl transferase (HAT; p300/CBP-associated factor [PCAF]) and a HDAC (HDAC4) are localized to the sarcomere matrix and that a HDAC inhibitor increases force generation in treated myofilaments8. In 2011, Dr. Gupta’s laboratory went on to show that an additional HDAC (HDAC3) is associated with cardiac sarcomeres9. Using a broad spectrum anti-acetyl antibody, the researchers determined that one of the acetylated proteins is myosin. Recently, Foster et al10 reported that in an initial acetylome of porcine heart proteins, 240 proteins were modified on 994 lysine residues with myosin acetylated on many different lysine amino acids. 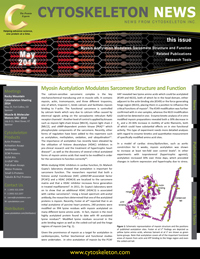 In fact, myosin is the most highly acetylated protein found to date with 49 acetylated lysine residues10. 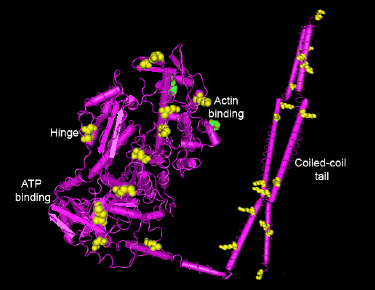 Modified lysine residues occurred in the actin binding region as well as the coiled-coil tail and the hinge regions of myosin (see Fig. 1). Figure 1: Schematic representation of myosin structure and the positions of published acetylation sites. Foster et al. 's10 findings are depicted as yellow lysine amino acids, whereas Samant et al. 's9 are shown as green lysine groups. Note that acetylation covers all of the important functional areas of myosin from actin and ATP binding to the hinge region and even the coiled-coil tail. Given the prominence of myosin as a target for acetylation in cardiomyocytes, further biochemical and functional studies were undertaken. In vitro acetylation of myosin by the PCAF HAT revealed two lysine amino acids which could be acetylated (K549 and K633), both of which lie in the head domain, either adjacent to the actin binding site (K549) or the force generating hinge region (K633), placing them in a position to influence the critical functions of myosin9. The K549 modification was further confirmed with in vivo samples, whereas the K633 modification could not be detected in vivo. Enzyme kinetic analysis of in vitro modified myosin preparations revealed both a 30% decrease in Km and a 20-36% increase in motility of actin filaments, both of which could have substantial effects on in vivo functional activity. This type of experiment needs more detailed analyses with regard to enzyme kinetics and quantitative measurement of specifically modified amino acid sites. In a model of cardiac stress/dysfunction, such as aortic constriction for 6 weeks, myosin acetylation was shown to increase at least ten-fold over control levels9. In other experiments with isoproterenol (hypertrophic agonist), acetylation increased 30% over three days, which preceded changes in isoform expression and hypertrophy due to stress. These observations indicate that acetylation is a rapid modification of myosin which causes adaptive changes toward improved mechanical efficiency. Intriguingly, the whole acetylome detection method employed by Foster et al10 and used by other groups for other tissues, could not detect the two acetylated lysines that Dr. Gupta’s laboratory reported. This is a common observation in broad acetylation studies where there might be significant overlap (30-60%) between detected acetyl peptides from different reports, but there are also significant novel findings. This effect is probably a consequence of the new field of research and different methodologies employed, both of which do not capture the full extent of the discovery. Future experiments, methods, and grants would benefit from determining the percent acetylation, new antibodies with broad and specific sequence recognition, and techniques to specifically modify or represent acetylated forms of particular amino acids. To aid in the acetylation research field, Cytoskeleton has recently introduced a new monoclonal antibody (Cat. # AAC01) which has unique sequence recognition compared to other anti-acetyl antibodies (see Product table for further information) and which readily detects acetylated myosin. This highly robust Anti-Acetyl Lysine Antibody recognizes a wide range of acetylated proteins in IP, WB, ChIP, and IF applications. This Anti-Acetyl Lysine Antibody has many advantages when compared to other commercially available antibodies on the market. See for yourself here. Song L.S. et al. 2005. Calcium biology of the transverse tubules in heart. Ann. N.Y. Acad. Sci. 1047, 99-111. Seguchi O. et al. 2007. A cardiac myosin light chain kinase regulates sarcomere assembly in the vertebrate heart. J. Clin. Invest. 117, 2812-24. Sumandea C.A. 2011. Cardiac troponin T, a sarcomeric AKAP, tethers protein kinase A at the myofilaments. J. Biol. Chem. 286, 530-541. Cui Z. et al. 2013. Regulation of cardiac proteasomes by ubiquitination, SUMOylation, and beyond. J. Mol. Cell Cardiol. doi: 10.1016/j.yjmcc.2013.10.008. Terman J.R. and Kashina A. 2013. Post-translational modification and regulation of actin. Curr. Opin. Cell Biol. 25, 30-38. Ling S. et al. 2012. CKIP-1 inhibits cardiac hypertrophy by regulating class II histone deacetylase phosphorylation through recruiting PP2A. Circulation. 126, 3028-40. Kook H. et al. 2003. Cardiac hypertrophy and histone deacetylase-dependent transcriptional repression mediated by the atypical homeodomain protein Hop. J. Clin. Invest. 112, 863-71. Gupta M.P. et al. 2008. HDAC4 and PCAF bind to cardiac sarcomeres and play a role in regulating myofilament contractile activity. J. Biol. Chem. 283, 10135-10146. Samant S.A. et al. 2011. HDAC-3 dependent reversible lysine acetylation of cardiac myosin heavy chain isoforms modulates their enzymatic and motor activity. J. Biol. Chem. 286, 5567-5577. Foster D.B. et al. 2013. The cardiac acetyl-lysine proteome. PLoS One. 8, e67513.